A project that has pioneered the introduction of sustainability and climate change into degree-level nursing education has won a prestigious national newspaper award. NursusTOOLKIT, a comprehensive set of teaching materials developed by academics in the University of Plymouth’s School of Nursing and Midwifery, and launched in conjunction with colleagues at partner institutions in Europe, was awarded a Guardian University Award in London last night. Members of the project team received the honour from TV presenter Lauren Laverne, after it beat off competition from the University of Manchester in the Sustainability category. It’s the third Guardian University Award that Plymouth has won in six years. Funded by the European Union, and made available free of charge to educators in the UK and overseas, NurSusTOOLKIT has already been adopted by a number of domestic and overseas institutions and has received the backing of senior leaders in the health sector. 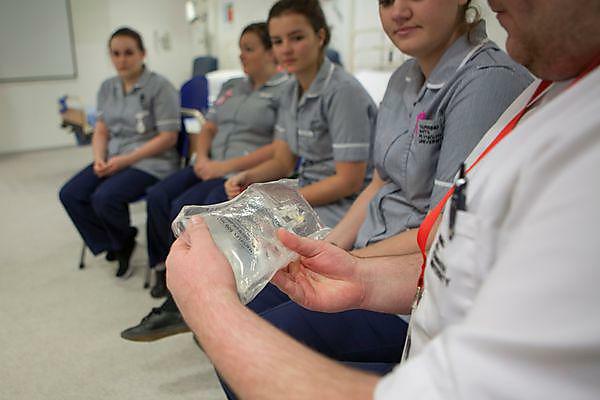 The concept behind NurSusToolkit was developed internally at Plymouth, and ‘tested’ by nursing students working with undergraduates in product design to consider the implications of climate change for services and equipment used in hospitals. Plymouth invited institutions from Spain, Germany and the Netherlands to work with them in taking the project forward, and together, with an EU grant, they developed the multilingual teaching materials that cover not just nursing and midwifery, but geography, design, public health, and health planning and management as well.